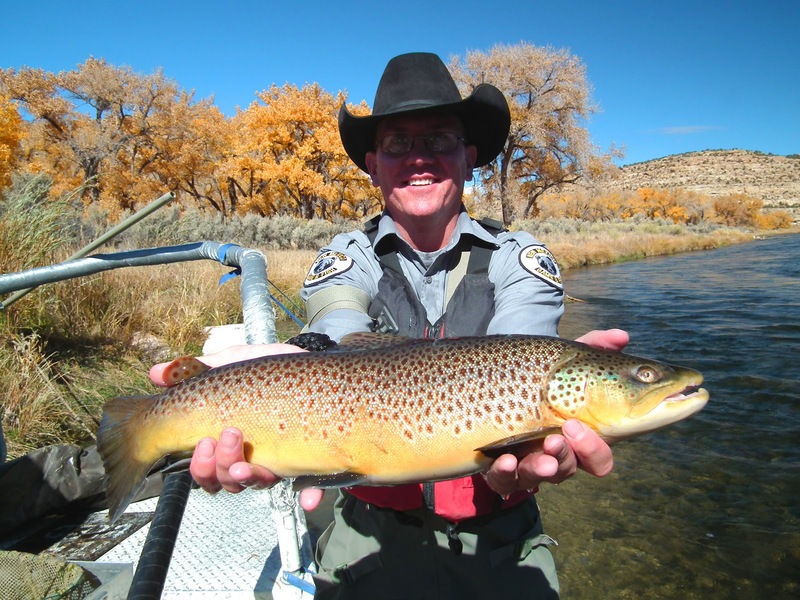 Marc Wethington, San Juan River Fisheries Biologist for the New Mexico Department of Game and Fish (NMDGF) shows off a fat brown trout pulled from the river during a fall 2012 survey of the river and its trout population. 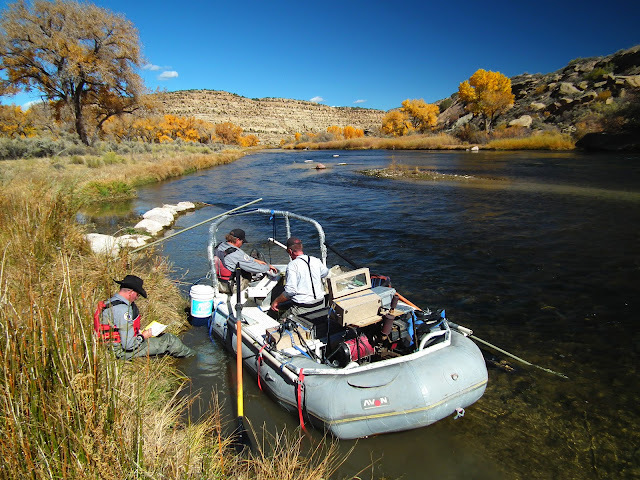 Wethington uses a raft mounted, generator powered, electro-shocking unit to pass an electrical current around and beneath his raft as he moves downstream. Fish in the vicinity of the passing raft are then stunned and float to the surface where workers can net them and put them in an on-board holding tank from which they can be retrieved, weighed, measured and inspected. 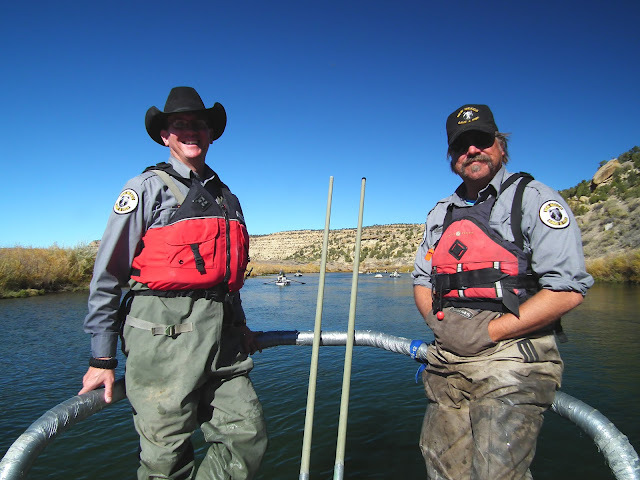 NMDGF Conservation Officer, Storm Usrey, on the left and NMDGF Coldwater Fisheries Biologist, Richard Hansen, to the right, enjoy a beautiful fall day while working on New Mexico's blue ribbon trout stream, the San Juan River at Navajo Dam. Hanson releases one of many healthy trout captured during the survey operation while Usrey takes notes. Karl Moffatt, publisher of the blog "Licensed to Fish" and "Outdoors New Mexico" frequently produces freelance articles for the game and fish department's "New Mexico Wildlife" magazine and is often invited to ride along during fish surveys. 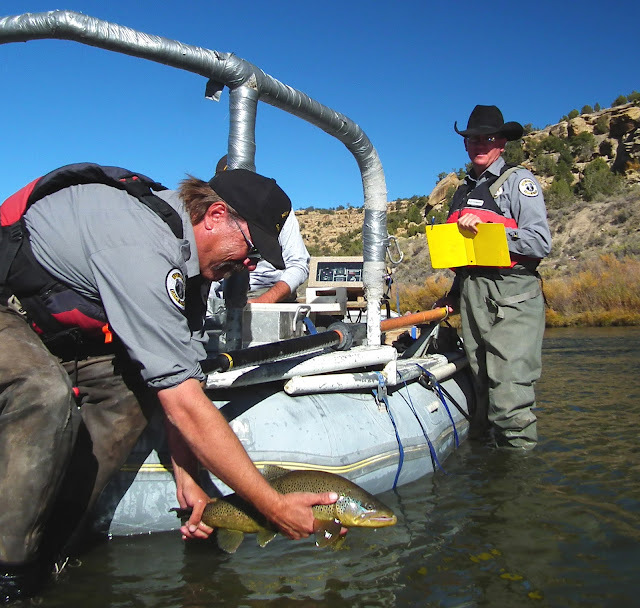 The San Juan River's population of feisty rainbow trout remains stable due to a steady stocking program while the resident brown trout continue to thrive due the cold clear water flowing from the base Navajo Dam. 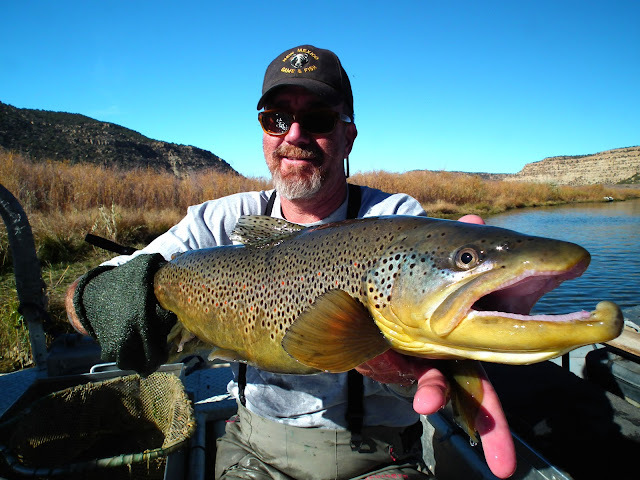 Large brown trout can frequently be found in shallower waters by gravel bars on the lower San Juan River during the fall as they prepare to spawn. 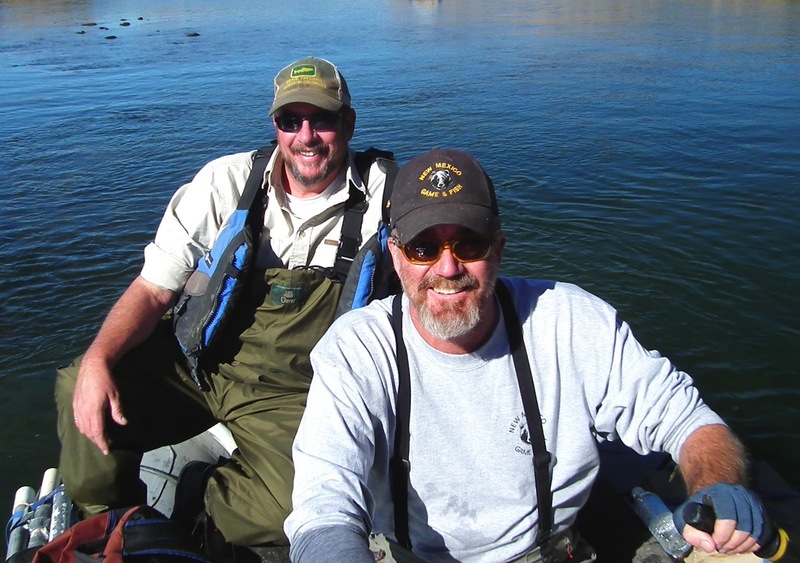 Anglers are urged to leave them be so they can reproduce successfully. 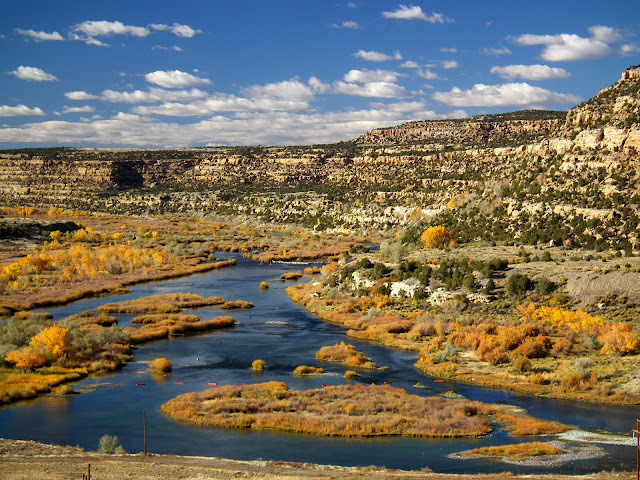 The San Juan River below Navajo Dam offers anglers over seven miles excellent trout fishing and incredible scenery. Special regulations apply. Consult your fishing proclamation. Looking good Carl! 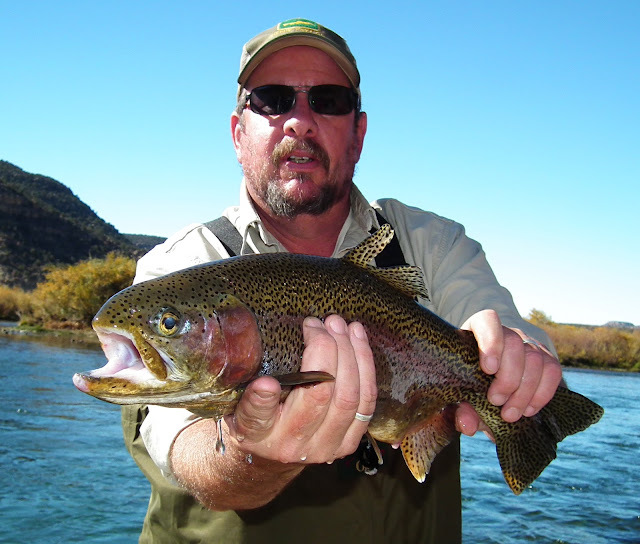 NM Game & Fish does a great job of keeping our fisheries thriving.